I love receiving Christmas cards. In the “old” days the cards started arriving the day after Thanksgiving and were hung across the window frames and lined the entrance doors to my house covering the doors like wallpaper. My favorites were the cards that had glitter glued on them, they looked so elegant. In the past 10-15 years the cards I receive have dwindled significantly. The religious tone of the season’s message was replaced by photos of family on some of the cards. Digital cards have also become popular as they send messages of holiday cheer via music and magical animation. This year the beautiful card above was sent to me by my 3rd cousin Victoria Di Nella. Vickie lives about 2 miles from the house I was raised in. Her great grandmother is Bibbiana Celestina Ciolli. My great grandmother Elvira and Bibbiana were sisters. I had the pleasure of meeting Vickie in 2011 at the home of another cousin, Allen Adezio. Allen and his wife Marie hosted a lunch for Vickie, myself and my sister Lori. You can read about our fun day by clicking here. If you click on the card to enlarge it, you will see the name DiNella in lower left corner. 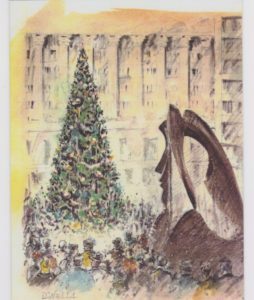 Inside the card was a lovely holiday message and text which says “The artist of this original watercolor was Carl DiNella. c 1960”. Me being me, I wanted to find out more about the card and Carl so I emailed Vickie. Vickie explained that her father Emilio had an older brother named Carmello (Carl). 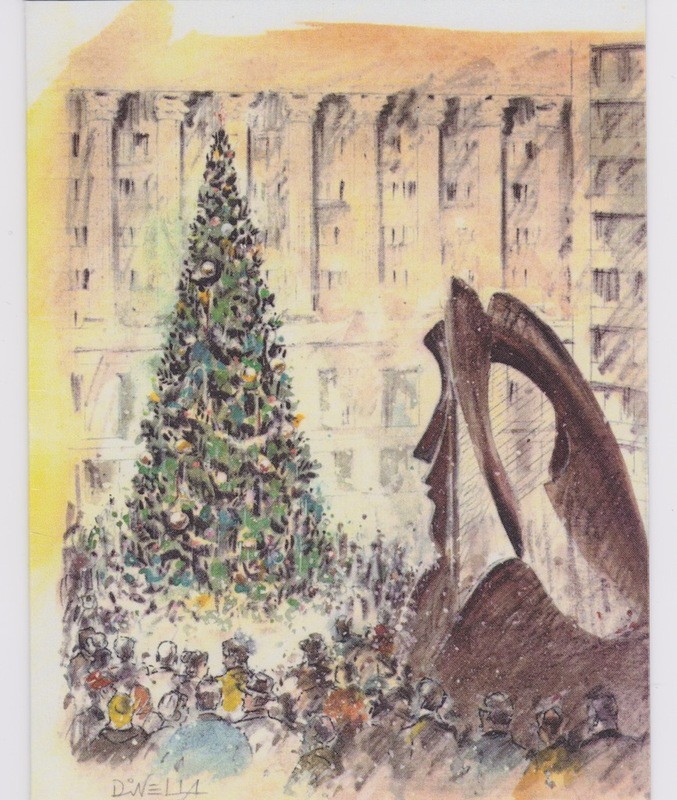 Carl was an artist and Vickie took a photo of a watercolor Carl painted, then made it into the Christmas card. Carl has passed away but Vickie has created a wonderful way to keep his memory alive and share Carl’s talent. The painting to the right (click to enlarge) is a watercolor that Carl painted in 1952 which was the year that he visited Pescasseroli, Italy. 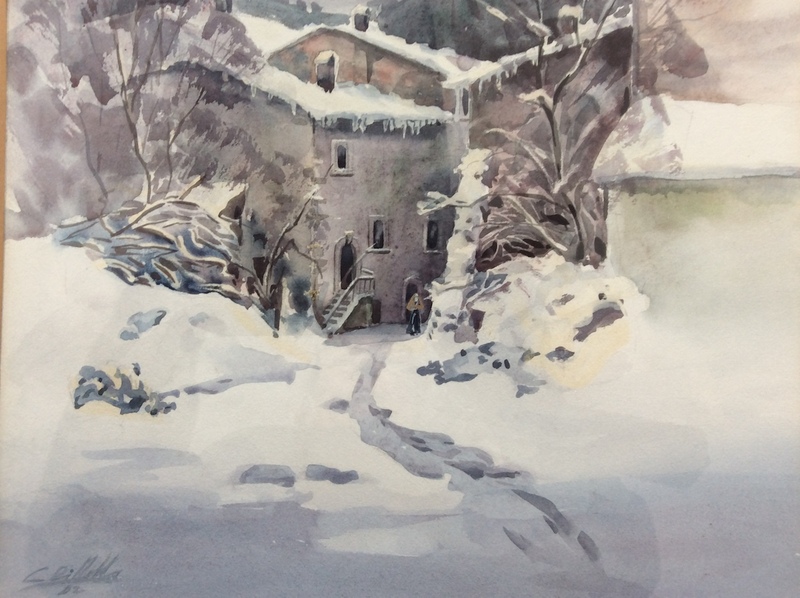 Below are a few more photos of watercolor paintings that Vickie has shared. Thank you Vickie, your uncle was very talented. That was a beautiful card, I can’t believe you asked Vickie about where it came from, but it does not surprise me! I find both articles amazing. Christmas cards are lovely.